Engine Winterizing Kit plumbed to flushing adapter on outboard lower unit. Wrench and socket that fits screws on your engine’s air box cover. Take the motor hood off and you will see the cover on the front of the engine, usually made of black plastic. If your engine has a fogging oil fitting, you do not need to remove the air box cover. 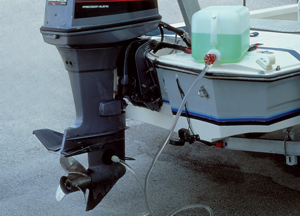 Four-stroke outboards have a plastic air intake that you spray the fogging oil into. Fuel stabilizer in a size to treat your fuel tanks. For example: Star brite’s EZ-To-Store, EZ-To-Start comes in 8oz. and quart sizes. One ounce treats five gallons of gas. Fogging oil in a spray can. Get the kind with a maintenance valve fitting if you have a Johnson or Evinrude outboard, 1990 and newer, with a maintenance valve. First, does your boat have a fuel-water separator? If it does, change the filter element. If not, consider installing one of these handy devices, like the Racor SNAPP™. It will help to keep gunk out of your engine, since the ethanol in E-10 gasoline is a solvent that dissolves rust, dirt and resins from your fuel tank. The fuel-water separator also will alert you to the presence of water, so you’ll know if the gas in your tank has “phase separated” into layers of gasoline, alcohol and water. Next, fill your gas tank about 95 percent full, and add the proper amount of fuel stabilizer. The stabilizer prevents the fuel from deteriorating over the winter months. Don’t completely fill the tank, because extreme changes in temperature can cause the fuel to expand, forcing fuel out of your overflow vents. With the tank filled and stabilizer added, run your engine for about 15 minutes, which ensures that the stabilized fuel gets into the fuel lines, carburetors and filters. Your other choice is to use up all of the fuel before the season’s end and put the engine away with a completely empty tank. Clean, stabilized fuel or an empty tank—those are the choices to ensure you won’t be dealing with “sour” gas during spring commissioning. Drain the water from the motor, even tilting it up and down several times to ensure all the water drains out. If you use your motor in brackish or polluted water, you'll want to flush the outboard with fresh water to minimize deposit accumulation. Make sure the cooling system is drained completely as well. There is some risk winterizing this way as any leftover water remaining in the block could cause a crack. Water that remains in the exhaust passages will run into the cylinders causing serious damage. Because of this potential damage, we believe flushing with antifreeze is an easier and safer winterizing plan, especially if you own a bigger engine. Running antifreeze through your outboard is a quick step to aid in preventing corrosion during the winter as well. 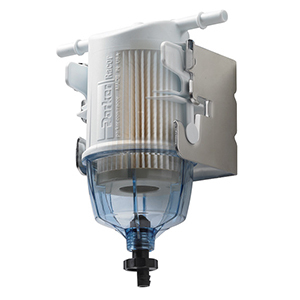 Marine Engine Stor includes an adapter that fits Johnson/Evinrude engines with a maintenance valve. 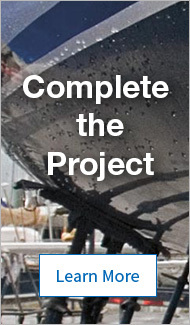 West Marine sells a do-it-yourself winterizing kit to make this job simpler. Begin by connecting your garden hose to a faucet, hooking it to a motor flusher, placing this over the raw water intake, turning on the freshwater and starting your boat’s engine. Let the outboard warm up to operating temperature, so the thermostat will open and let coolant circulate through the entire engine. Warming the engine up is important, as it also lets the fuel stabilizer circulate through all fuel lines plus the carburetors or injectors. After warming the engine up, turn it off and hook up the winterizing kit to the motor flusher, in place of your garden hose. The cowling should be removed, so you have access to the air intakes on the front of the engine. 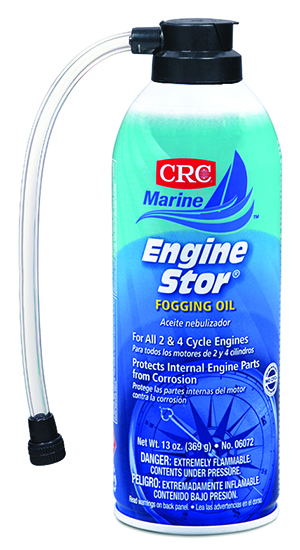 (Note: Newer Johnson/Evinrude engines have a Maintenance Valve, and CRC’s Engine Stor® Fogging Oil has an adapter that fits these.) Start the engine up again, open the valve to the tank of the winterizing kit, and watch the antifreeze level drop in the tank. You should begin to see antifreeze discharging from the exhaust. When the tank is nearly empty, begin spraying fogging oil into the carburetor. This will usually cause lower-horsepower engines to stall, while higher horsepower engines may cough and sputter, but continue running while emitting white smoke. Spray a good amount of fogging oil through the intake and then disconnect the fuel line from the engine, and continue spraying fogging oil into the engine until the engine dies. Usually the engine will run rough and emit white smoke just before it dies. Giving it a good dose of fogging oil will apply an anticorrosive coating to the interior surfaces of the cylinders. Letting the engine run out of fuel burns up all of the fuel from the carburetors, preventing the formation of varnish deposits from evaporating gasoline. If you have an EFI engine, the process is a little different. Put an ounce of 2-cycle outboard engine oil in the fuel-water separator, and then run the engine briefly to coat the internal components. You can also fog the engine, if you’ve completely emptied your fuel system, by individually removing each spark plug, spraying fogging oil into each hole, and then rotating the prop by hand (with the engine in gear) to spread the oil around the cylinders. Since you’re removing the plugs, now is a good time to check their condition, re-gap them and replace if necessary. Before putting your outboard away, you’ll want to change the oil in your lower unit. See our Advisor on that topic for the details. You should also completely fill the oil tank (for oil-injected 2-stroke engines) so that water won’t condense inside the tank and contaminate the oil supply. Clean and lubricate all pivots and other gears with the grease or oil your Owner’s Manual recommends. 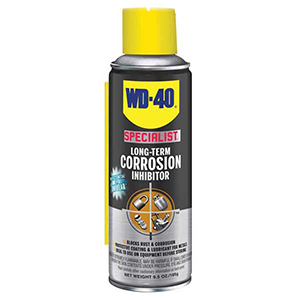 Spray a mist of WD-40 Specialist™, Lear Corrosion Block or similar product on the powerhead. Remove the propeller, inspect it for damage, and have it repaired or replaced as needed. Check the shaft for monofilament fishing line wrapped around it, which could damage the seal. Lubricate the shaft with grease and reinstall the prop, or leave it off to discourage theft if the engine is staying attached to the boat. Finally, you should store the engine in an upright position, so any water will drain out. Now you’re done, and your outboard is ready for hibernation.